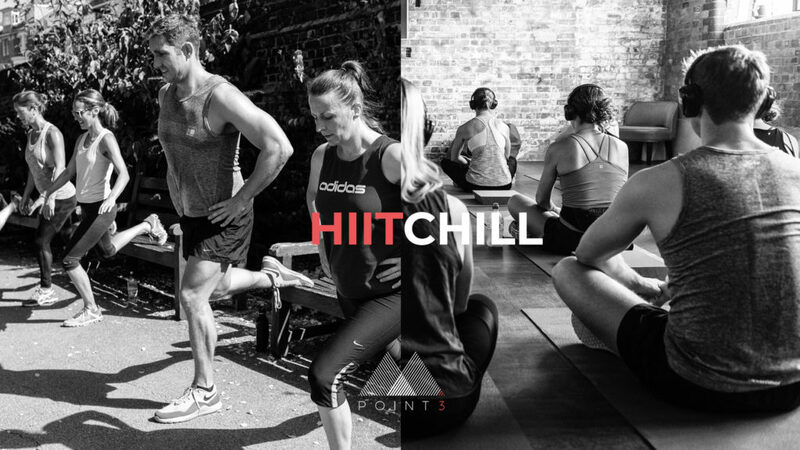 At POINT3 Wellbeing we have created a workout – HIIT+CHILL – that we are super proud of. HIIT+CHILL includes a fusion of HIIT (High Intensity Interval Training) which spikes your heart rate, torches calories, conditions muscle and improves your overall physical health; and CHILL, a mindfulness experience that calms the busy mind. So, how and why did we come up with this workout experience? First, let’s start by asking a question. Put your hands up if you have too many hours in your day and find yourself wistfully living in the present moment? I’m sure that you, like me, and the majority of people out there find it difficult to stop and take a breath, let alone factor in quality time for yourself in this hectic, fast-paced life we live in. Prioritising those moments in the day to do things just for us, those things that make us tick, is so important in order to find a sense of happiness and wellbeing in this frenetic world we live in. For many years I’ve been incredibly passionate about physical exercise in all forms. Just as long as I was able to find some time to get a sweat on, then all would be well in my world. My physical exercise was also my mental therapy. I was also fortunate to work with some like-minded individuals. We would regularly find ourselves pulling on our Nikes and taking our meetings on the go, running alongside the river whilst running through our business agenda. And you know what? Not only did it help induce significantly more engaging (no distracting screens whilst jogging!) and creative conversations (who would have thought that not everything needs to be solved in a meeting room, even those with inspiring quotes adorning the walls! ), but my productivity over the course of the day was higher too. But it wasn’t always like that. It was only after coming out of a particularly long and stressful work project in 2017 that I was able to reconcile just how important physical exercise was for me, not only from a personal perspective, but crucially from a productivity point of view at work. The project took its toll on me emotionally, mentally and physically. I had been sat well and truly in the panic zone, stressed for three months non-stop. From the moment I opened my eyes in the morning to the moment I closed them in the evening, I would be glued to a screen, fielding emails, calls, project plans. I was wired. I was working at a 100mph. I was also floundering and making basic mistakes. With hundreds of emails and calls coming in each day, the only way I felt I could manage it was to shut down every other area of my life. I was living off takeaways, disjointed sleep and the blue glow from countless screens. Everything else had to go so that I could stay on top. I simply didn’t have enough time in my day. Without realising it, I was removing the things that made me tick, energised and productive. Life was one big, painful, stress storm. I got through this project by the skin of my teeth but in the aftermath I wanted to better understand my coping mechanisms, so that if I ever found myself with a similar level of pressure again, I would thrive rather than simply survive. I’m never more present than when I’m moving under my own steam – walking, running, cycling, swimming, HIIT. The removal of the ultimate distraction – a screen – keeps me grounded and in the moment. Those powerful endorphins – the brain’s happy chemicals, really do work. A daily dose of those released when exercising, is good for the mind, body and soul. So how could I turn this knowledge into something that would be achievable even when time is seemingly against us? In my previous life in events marketing I was incredibly lucky to work alongside sports scientist Dr Tom Brownlee. POINT3 Wellbeing worked with him to understand the minimum amount of exercise time that is needed in order to see physical and mental health gains. As a result of this research, we created HIIT+CHILL, aimed especially at busy individuals who find that time is always against them. HIIT+CHILL in its most basic format (although we do of course run longer formats) is just 8 minutes of physical exercise and 3 minutes of focused breathing. Incredibly, 8 minutes of continuous, high-intensity physical exercise, just three times per week is sufficient to see improvements in our physical health. No more feeling guilty missing those two hour gym sessions! And just 3 minutes of mindfulness – when you focus simply on the breath – enables us to recover from the effects of stress, and all that happens when our body goes into the fight or flight state. So, as little as 11 minutes per day would have been sufficient to provide me with the movement and mindfulness I needed to significantly reduce my stress levels. My performance would have improved and in turn I would have increased my overall wellbeing (and probably not picked up quite so many grey hairs along the way). If I had known just how powerful those 11 minutes would have been, I would have made it my priority each day. This would have shown me and my colleagues that I was also making my overall wellbeing my priority, which we should all be doing. It’s no secret that a healthy, happy person is a more productive person. With that in mind, even just a short burst of movement and mindfulness really can have such a powerful impact. If you don’t believe me, check out our weekly 11 minute challenge and commit to just one challenge every day. I really think you will feel better for it, and even in your busiest periods, you should be able to squeeze 8 minutes of movement, and 3 minutes of mindfulness into your day. We would love for you to experience HIIT+CHILL in its longer formats. We describe these events as a mini-retreat, so do check out our events page for upcoming sessions. Be well, be happy, be you.